More Golf Today is an online retailer for purchasing rounds of golf from courses at extreme discounts. Their focus is on limited-time deals that last for one week only. Users of the website are able to save upwards of 80% off regular rates for golf by purchasing these time-sensitive deals. 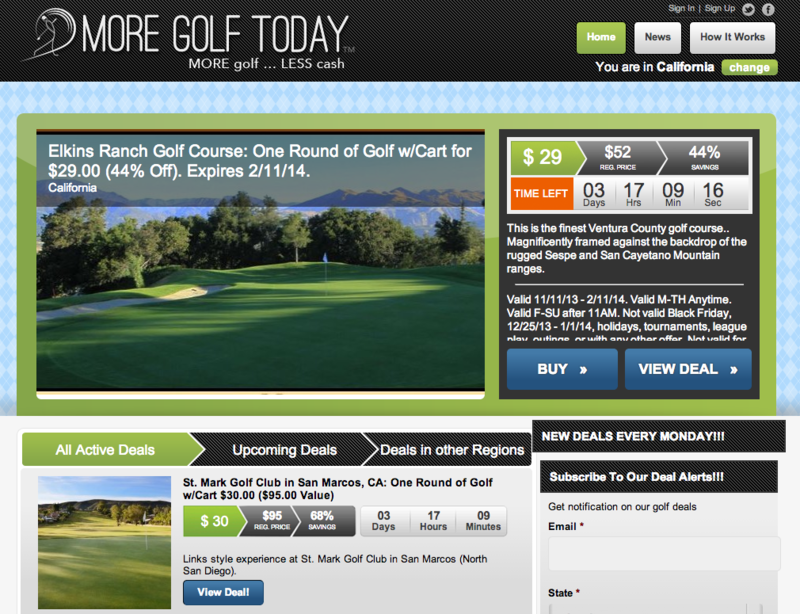 Similar to websites like JetSetter and Groupon, More Golf Today provides member-only (membership is free!) discounts based on limited availability with deals that are available for only a short period. They are currently operating in California, Arizona and Illinois with more states coming soon. Jason Tenzer, President and CEO of More Golf Today, explains that their marketing strategy is heavily focused on communicating with current users via social media and email. Due to the time-sensitive nature of the product, it is imperative that they are able to easily keep their users in the loop on new or expiring deals. Their use of Facebook, Twitter and email allows them to push messages out to their user base to ensure that they are never missing out on a deal that is well suited to them. Having launched in September of 2012, More Golf Today is a relatively young company. In this short period, they have already expanded from the California market to add Arizona and Illinois golf courses to their offerings on the websites. In order to continue their growth and acquire new customers in these new regions, they are focused on continuing to grow their social media presence and email database. In order to maintain their rapid growth, More Golf Today is always looking for ways to attract new customers. For this reason, they began running regular giveaways. When asked why More Golf Today uses PromoSimple to power their giveaways, he explained that “It’s very easy. It’s another way to promote my deals.” Giveaways are used to keep current customers engaged as well as attract new members and allow their current user base to help them spread the word about their website and deal product. In order to attract the right entrants, the selection of a giveaway prize is crucial to the promotion’s success. Because their target audience is very specific (golfers), the prizes that are offered in their giveaways are geared toward their audience. They have given away foursomes at top country clubs, hotel stays at the golf course, clubs, putters and golf-related electronics like the Voice Caddie. This prize selection ensures that the users who are becoming their social media fans or subscribing to their newsletters are truly interested in their product – golf! By working with their partners and sponsors who are interested in growing their brand awareness for More Golf Today’s growing audience of avid golfers, it is a win-win situation. More Golf Today is able to attract new members and the giveaway sponsor is able to advertise information about their product or service to a very specific niche. In order to maintain their deal inventory and continued expansion into new territories, they are tasked with identifying new partners (golf courses) regularly. Tenzer explained that they have great success with identifying and communicating with new, potential partners through their active use of LinkedIn. When asked what aspects of running giveaways have helped More Golf Today the most, Tenzer explained that the inclusion of items such as bonus ‘Tweet’ entries has helped to spread the word. More Golf Today has been a first adopter with new PromoSimple features, explaining that “I think it’s a good product and I want to grow with it.” Most recently, they have begun including the Refer A Friend option to further increase the viral reach of their giveaways.